The planning of this layout began already in 1998, when I was exploring the possibilities of the available room avaiting me in Spain. The design was done on computer, using the program TRAINCAD by Tor Sjøwall, Norway. 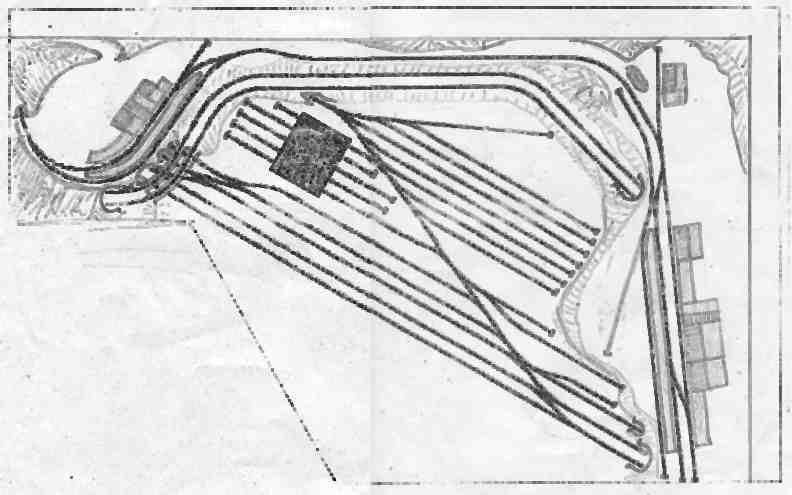 Below is a blueprint of the 3 levels used in the layout. The second level is the "long uninterrupted part" of the main line. Here the trains move with a much higher voltage-setting than in any other part of the layout. The signal-blocks just at the entrance to this part of the main-line is timed so that 2 trains almost always cross exactly at the middle of the visual part of level 2. The visual effect of the fast-moving crossing trains is very good! Special attention should also be paid to the kind of shadow-station here: It is not really a part of the self-blocking system (so I lied when I said 8 blocks. There are really only 7 and this -special- block.) Here, every second train to enter the shadow-station is held back one block; I.e. one train will pass it, before the the train is again released into the self-blocking system. This makes for a less boring and preditious flow of trains. It was an experiment that has turned out well, and for my next layout I will definatly include more of this type of tricks for changing the sequence of the trains. The third level is for the mountains. "Mountains" is what it should have been, but because of the inclination of the ceiling, the height is very limited. I have actually moved the horizon 20cm away from the wall, thus gaining 10cm more height, but still it is not close to anything that looks natural. So what I have is a kind of plateau where the mountain-line goes through one small station and ends at another small station. Two old Märklin 6600 electronic controllers do the waiting and reversing of direction. A hidden crossing-station allows two trains to run simultainously in auto-mode between the mountain station and the Grand Central Station. The layout meassures 5 * 3 meters. -Less a triangle for the workbench and contols. There are about 100 meters of rails (99.3m according to the CAD-program ;-), with 53 switches/double-crossings, disstributed among the 3 levels. The main line is divided up in 8 consecutive blocks (automatically controlled). The smaller mountain-line has utomatic controls for up to 2 trains. The layout acommodates the 25 locomotives, but not all of the more than 200 waggons fit there. some 30 signals control the trafic. About half of them under permanent automatic control. The caternary wire is for show only. It has no electrical function. All material is original Märklin, except for around 40 waggons and a locomotive. Some copy-products from Electrotren and Aneste are also used. Currently the main station is still using M-tracks, but I am planning a change to K-tracks. All hidden parts however will remeain with the old M-parts. The layout is NOT operated with computer or any digital equipment. Everything runs in traditional analog mode.